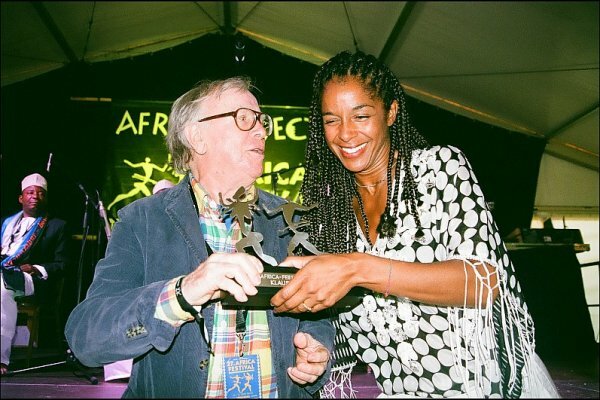 Each year the Africa Festival gives the Africa Festival Award (AFA) to musicians and artists who are characterized by their extraordinary talent. Furthermore, it is awarded to institutions which have committed their work to Africa in a special way. 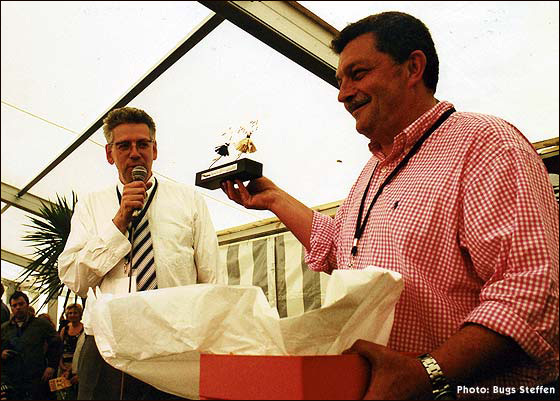 The award is given during the official opening of the festival. we will now present the laureate of the "Africa Festival Award 2017". I am quite certain that when this secret is revealed, the sun of Africa will shine with a charming smile on the person's face. She is an artist who likes the music and the colors of Africa, plays with them and combines both in her performances. The modern as well as the traditional Africa. She leaves her national borders to find new sources of inspiration. Which make her kind of art so unique. If you meet her, she is open to any conversation and hospitality is not only important at her home. Many of our festival guests who already had the pleasure to meet her will confirm this. Another characteristic of her is her generosity, her empathy and kindness. To help disadvantaged people in the neighborhood to benefit from their abilities - they give them a new home at their home on the West African coast, teach them and thus open up a new and hopeful life perspective. Her artistic career began when she was still a child. She had never been satisfied with the clothes which her parents gave to her. With scissors and some sewing thread she quickly created something unique, which she proudly presented to her friends. Today, her unique pieces can be admired at the big fashion shows in Dakar, Frankfurt or Vienna, or here, on the Mainwiesen at the Africa Festival - ever since 2012. Ladies and gentlemen, the "Africa Festival Award 2017" goes to our fashion designer from Senegal: Madame Rama Diaw N'Deye! this year the Africa festival is honoring a man and his work who is one of the most important figures in African music for many decades. He is a true ambassador for the continent’s music because he brought the sound of Africa to all over the world. But he is not only one of the greatest musicians that ever came out of Africa. He is a great human being too. He was and still is true and serious fighter for peace, justice, freedom and human rights. He has fought many struggles in his life but he never became a bitter man. I deeply admire that he never lost his charme and his good humor. One example: At his last year’s concert here in Würzburg he introduced himself as “Klaus Adolf born in Wiesbaden”. There, he told the audience, he fell into the river Rhein and was carried through rivers and seas until he stranded on a beach somewhere in Africa. When he is playing his music on stage he literally seems to be half as old than he actually is. You can experience that in a few hours over there in the big circus tent. 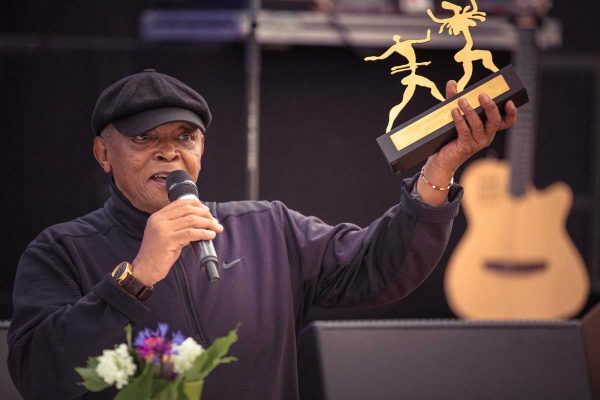 This year it is an extraordinary honor for me to hand over the Africa festival’s Lifetime Achievement Award to a living legend of African music, the musical voice of fight against Apartheid in South Africa, the late great and the one and only HUGH MASEKELA. 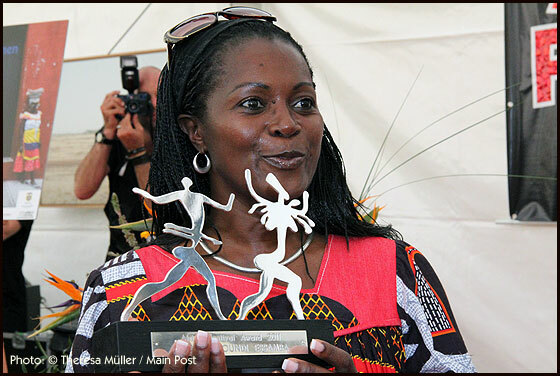 The person who will receive the first Festival Award this year can virtually be called a fixture of the Africa Festival, as she has been a part of it for a long time. When you meet her on the festival ground she is always smiling. She embodies kindness and irresistible serenity. You always enjoy starting a conversation with her. But you should bring along some time. Because she likes to talk, sometimes a lot. But never too much. And she has something to say because she is very educated. At the university at which she studied, she didn’t settle for one subject, but chose to do several. This person exudes charm and energy to the same extent. Whatever she does, she does it with great commitment. The person I’m talking about is a young woman. She is a committed intermediary and mediator between the European, German and African culture. She is not afraid to express criticism, too. She is always open to new ideas and a helpful partner when it comes to realizing them. She has been a guest on the stage, or, more precisely, the stages of the Africa Festival and feels at home there. She gives the audience an understanding of the artist in a very enthusiastic way. During the years she has been with us, she has become the face of the Africa Festival, and we hope that she will continue to stay loyal to us for a long time. This year, the first Festival Award goes to our highly esteemed, charming host Sarah Bergh. Now let us talk about the second laureate, someone of whom we as Würzburg residents are particularly proud. Because, although he already left Würzburg a long time ago, he is still one of us. We also still consider basketball superstar Dirk Nowitzki one of us, although he has been living in America for many years. But his career in sports just wouldn’t have been possible without Würzburg. And when it comes to our laureate it is the same. He wasn’t born here but went to school in Würzburg. And he already rocked the stages of the city with his instrument when he was still young. At the beginning, he preferred blue notes, and started a matching campaign with some fellow musicians. But soon this wasn’t enough for him and Würzburg had become too small. From blue notes he moved on to odd bars and several musical experiments in different bands. He travelled to other countries and continents and turned to a new instrument, which, in Germany, was only known to insiders. Africa, to be more precise Northern Africa, where this instrument is very popular, became his second home. He performed with many famous musicians and still does to this day. 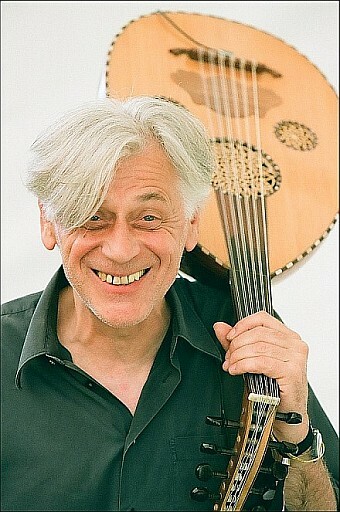 We are glad that he returned to his old home once again, and that this year he will demonstrate his ingenuity and virtuosity twice - at the oud and the guitar. For his great accomplishments regarding the musical dialogue between Europe and Africa we honour „our“ Roman Bunka with the Africa festival Award. Actually I could do without a laudatory speech for our third laureate. I could simply name two or three of his most famous compositions and everyone would know who I’m talking about. Especially, if you occasionally spend your Sunday in front of the TV. Superficially, many people may not perceive him as a musician who has a strong connection to the music of the African continent. But the musical style where he has been at home for decades would not be possible without the music of Africa. His numerous journeys for his concerts have also led him to Africa. And as he has always been receptive towards new things and curious towards extraordinary musical encounters, he has also performed with African and Brazilian musicians and still does. Decades ago, he founded a band with which he travelled to the most diverse musical worlds without needing a passport. And in those first days, a man who has made one of the most amazing careers in German rock music played the drums in this band. I want to make it short and not torture you any longer. At this venue we would like to honour a man for his lifework, particularly for his virtually visionary role as a mediator between Jazz and African music, especially Brazilian and Moroccan music. Congratulations Klaus Doldinger. 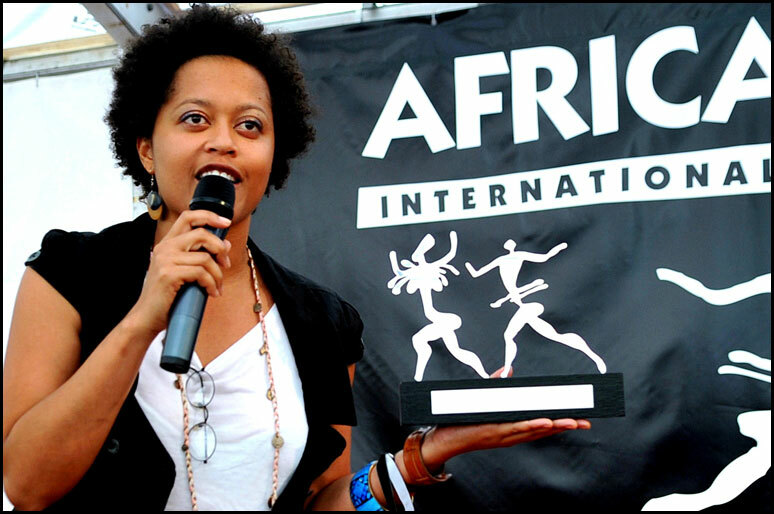 It has become a tradition for our opening ceremony that we give away one or several Africa Festival Awards. This year, too, we would like to continue this custom. We would like to honour an artist who is here but doesn’t yet know that we have chosen her. She is a young woman from Africa whom many of you don’t know yet. But I’m sure this will soon change. Because we are convinced that she will have a big career. In order to encourage her on her path we would like to give the 2014 Festival Award to her. Like many of her compatriots, she spends her time at her home country and the centre of her life which is France. Last year her first CD was released. We were so enthused by it that we immediately invited her to our festival. Although she is still young, she has tried many different things when it comes to music. She was a dancer for famous rappers, she trained her voice at a jazz school, produced her own TV shows and was a background singer for famous African stars. She is a self-made woman who writes and sings her own songs. With them she moves between afropop, jazz, soul and reggae without being cliché. On her first album she already invented and found her own style. She considers herself a cosmopolitan and wants to bring her African home closer to the people without losing sight of her present situation. Her name means “the one who creates awareness“. On stage tonight she will show us how exactly she does this. In the last one and a half years, we dealt with a country in Africa and have watched with great concern and also fear of what happened there. I speak of Mali, a country which we feel connected to for a long time - with its culture and in particular its music. The current happenings over there made us want to put Mali into the spotlight of this year’s festival. Also because it was the musicians and artists who particularly had to suffer from the radical Islamist rebels. The so called God Warriors wanted to silence them and also to destroy a centuries old culture. But the musicians were not silent and lifted up their voice, well knowing that they would draw the anger and rage of the invaders onto them. They defended themselves with their means and wrote songs in which they stand up for a free, democratic and united Mali. We’d like to thank Fatoumata Diawara for this song called “Mali-Ko”, for her courage and also for her dedication to the rights of women in Mali, and give her the Africa Festival Award 2013. If you take a closer look at the person, who will receive one of the two Africa Festival Awards this year, one question will come up quite quickly: Is there anything he cannot do? He is a true all-rounder, who is at home in so many cultural areas, so you do not even know where to begin with when talking about him. Many of you know him and have seen his show at this festival. Maybe you have even come across him today. He is an actor, drummer, entertainer and presenter, he is a singer and musician, he is charming and quick-witted, he knows how to captivate young and old when he starts to tell his stories in his charismatic manners. When he smiles all you can do is smile back. He is a truly positive person who makes other people happy and I have never seen him in a bad mood. The man I am talking about is originally from Senegal, where he was born in 1963. But you will not be able to tell that when you speak with him nowadays. Our awardee has been living in Germany for many years. Here at the Africa Festival he has become an institution. In all these years he has brought the African continent closer to thousands of children with his ‘sene-gallant’ style and his adorable stories, which is exactly the message the festival carries. You might have guessed by now who I am talking about. The awardee is standing right next to me. It is our highly appreciated host of the opening ceremony, Ibrahima Ndiaye, or just Ibo. This year there is a second award which we will award to a young lady. 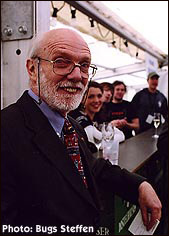 In 2000 two staff members of the festival travelled to Rotterdam to listen to a young singer who performed at the local world music festival. Rumours had it that she is a major insider’s tip who would fit right into our Africa Festival. Those two colleagues returned from this trip absolutely enthusiastic and we asked this young vocalist to perform at the festival in 2001. Her charming manners and her beautiful songs, which reflect the spirit of her native country, enchanted the audience here in Würzburg. Her breath taking songs, her fascinating way of performing, combined with her charisma and natural style make her concerts an emotional event which you cannot forget so quickly. “It is music to feel, not to explain.” She says herself. And nothing more can be said about her music. All the things I just mentioned are part of the reasons why she receives the award this year. Another reason is that her home country, which her songs are about, is the focus of this years’ festival. Nowadays she is known as the young voice of her home country who carried the traditions of her country over to modern times. After an illness caused break she is fortunately back on stage and delights the audience with her songs which you will be able to convince yourself about tonight at her concert. We are more than happy to have her here today and will give the Festival Award 2012 to Sara Tavares from the Cape Verde. The Artist was born in Cameroon and moved to Paris with the age of ten. After finishing school she moved to the Netherlands and was trained at the Nederlandse Fotovakschool (Dutch professional photography school). The artist had her first exhibition in 1985 at Maison Descartes in Amsterdam. She presented her pictures, with the theme “Passions” for the first time during the 4th Africa Festival nearly 20 years ago. Another exhibition called “Contrasts” followed in 1996. By now she is an internationally recognized photographer who has been exhibiting her work in Paris, New York, Amsterdam, Rome, Yaoundé and many other places. She was the first female African photographer whose art work has been published. Her work has appeared in a number of publications: Passion 1989, Contrasts 1995, Symboles 1999, Noirs 2001, La Métamorphose du sublime 2003, Dialogue 2006, Voiles & Dévoilements 2008. She has been living and working in Amsterdam for years. The Africa Festival Lifetime Achievement Award 2011 was presented to the Queen of Calypso, Calypso Rose (Trinidad / Tobago) by the Minister of Culture of Trinidad & Tobago, his Excellency Mr. Winston Peters. 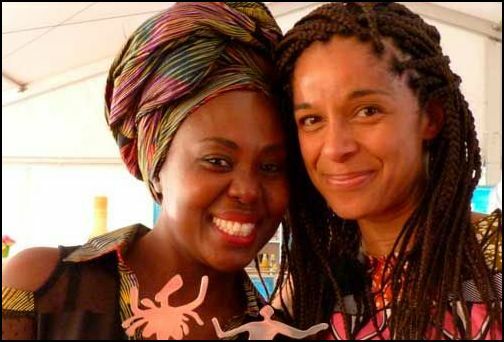 The first laureates and the Africa Festival have something in common. Both have the same age. They were already with us at the first Africa Festival. Back then they were running a workshop about African dance and music. For many years they have been regular guests of our festival. They have been with us for eleven years without interruptions and have delighted and astonished thousands of visitors with their performances. Music, acrobatic and clownish humour is their profession. Their name means mankind and expresses the liberal-minded attitude of the musicians, dancers and acrobats. They bring the spirit of the African culture and the zest for life to us and thus embody exactly what we want to convey with our festival. What makes them particularly stand out is the fact that they especially want to give children and young people a better understanding of these goals. They work in their homeland Ghana but are also welcome guests in European countries. 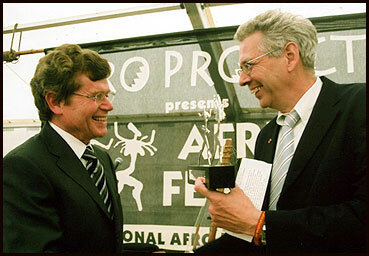 We are very delighted that they have been enhancing our festival for many years and thus today we want to thank them with the Africa Festival Award 2010. Our first laureate is the group Adesa. This year South Africa is the country of honour of the Africa Festival. Therefor the second award goes to the host country of the World Cup 2010. However, our laureate has nothing to do with soccer. He grew up in the South African township Vlakfontein (today: Mamelodi), where he is still living today. There he quickly came in contact with African music and poetry: He says about himself: “I learned to sing before I could even talk”. When he was 17 he had already performed on stage and started texting and composing his first songs. He has been a committed opponent of apartheid since his youth and in 1994 was invited to perform at the inauguration of Nelson Mandela whose policies of reconciliation he has always supported. He addresses the social problems of his country in soft tones and is committed to reconcilement. Nadine Gordimer called him a national treasure. Nelson Mandela himself won him over for his four-double-six-six-four-anti-AIDS campaign for which he has been advertising and collecting donations at his concerts and on his website. With our second award we don’t only want to honour one of the most important artists of South Africa, but above all a personality which can be called the voice and conscience of South Africa. 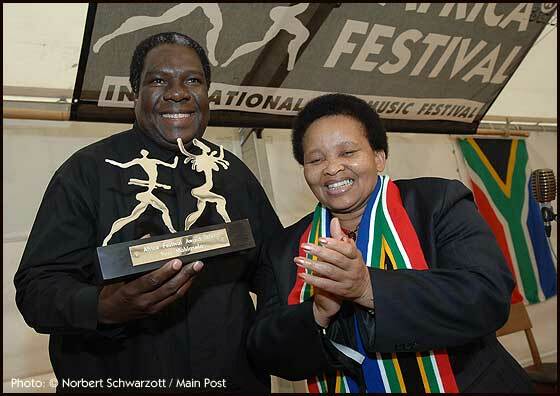 The Festival Award 2010 goes to Vusi Mahlasela. As a singer and musician he has justly gained world fame and his voice can be heard all around the globe. Thus he has generated awareness about Africa again. 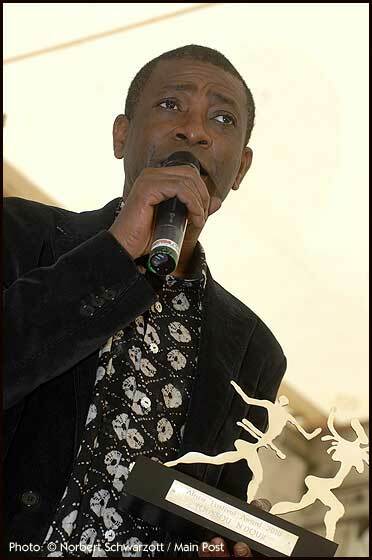 But today we would like to honour the ambassador for Africa, rather than the singer Youssou N’Dour. In the past Youssou N’Dour has campaigned strongly for Africa’s matters and his voice is always resonating loudly when the wellbeing of his continent and human rights is concerned. In 1985 he had already performed at the Free Nelson Mandela concert, had sung at Live Aid and at the Human Rights Now! tour of Amnesty International. He has been committed to the struggles of youths in his home country and the fight against malaria. In Senegal he started one of the first internet projects for young people and at his studio he offers jobs to many people. But principally: despite his international success, Senegal remains his home. There he is also publishing the magazine L’Observateur with his media group. The magazine likes to take a closer look at the powerful people and criticize them using strong words. Thus he didn’t only make friends with his work. But Youssou N’Dour is a fighter who doesn’t give up quickly. In return for his commitment, but also to give him a little encouragement to continue on his path we want to honour him with this year’s Africa Festival Award. 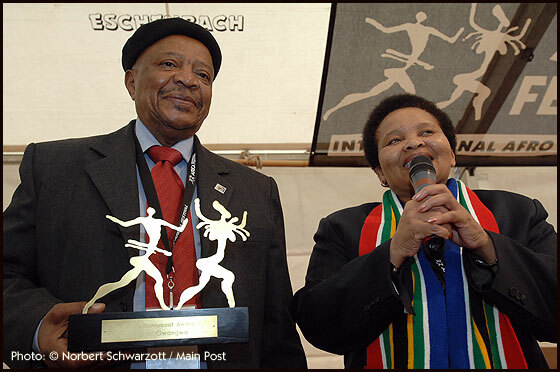 The first Africa Festival Lifetime Achievement Award 2010 was given to the famous South African trombone player Jonas Gwangwa for his lifework. The laudatory speech was given by the Minister for Arts and Culture Lulu Xingwana (South Africa). 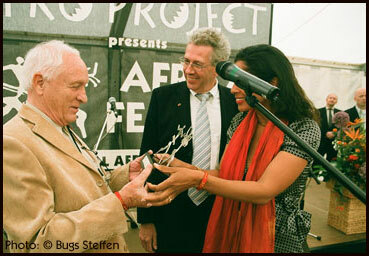 Now the moment where we would like to give away our Africa Festival Award 2009 has come. This year the management of the festival decided to honour three people. 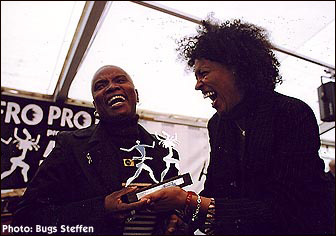 The first Africa Festival Award 2009 will be given to an artist of great international renown. He won’t be honoured for his extraordinary voice or his long musical career, but for his commitment to albinos. With his organisation “Salif Keita global foundation” he tries to make it easier for albinos to access education and get free medical care. We all know that in various countries albinos are subject to persecution, social exclusion and discrimination. 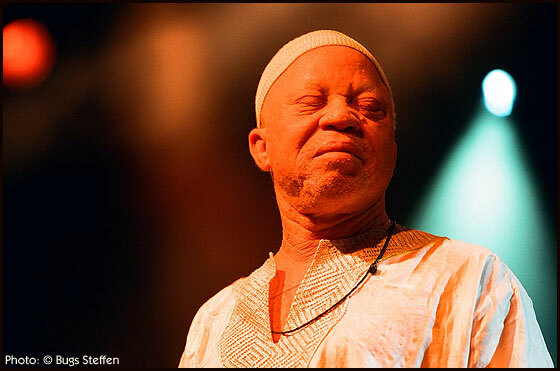 The Africa Festival Award 2009 goes to Salif Keita for defending the rights of albinos, which deserves recognition. As Salif Keita isn’t in Würzburg yet, we ask Mister Ba, minister for handicrafts and tourism of the Republic of Mali, to accept this award and give it to Salif Keita during his concert on Monday. 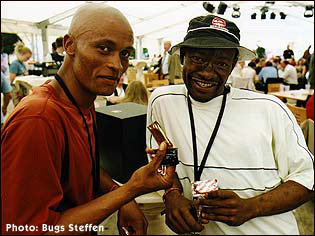 The other two Africa Festival Awards 2009 go to two gentlemen who have become a staple at the festival. Each year they bring sun, hospitality and a smile to the Africa Festival. Over the years, for many visitors, their tent has become a place for relaxing and meeting different people. Their traditional habits, their way of life and their art make many Europeans start dreaming. Without them realising, they are doing a great job at advertising their beautiful home country. These two gentlemen are ambassadors for a positive and upright Africa. The laureates of 2009 are Mister Alhous and Mister El Kassim, whom I cordially invite to accept the Africa Festival Award on stage. 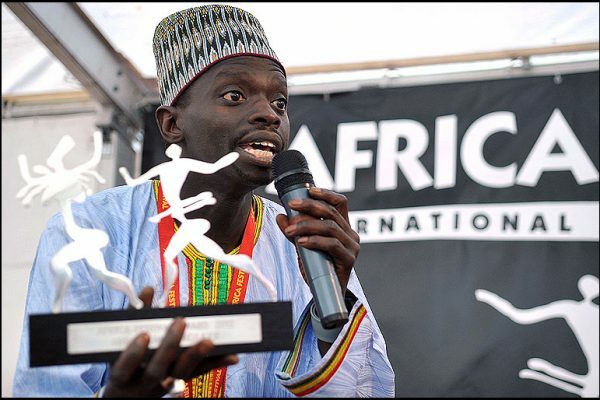 it has become a great tradition to give away the festival award during the opening ceremony of the Africa Festival. 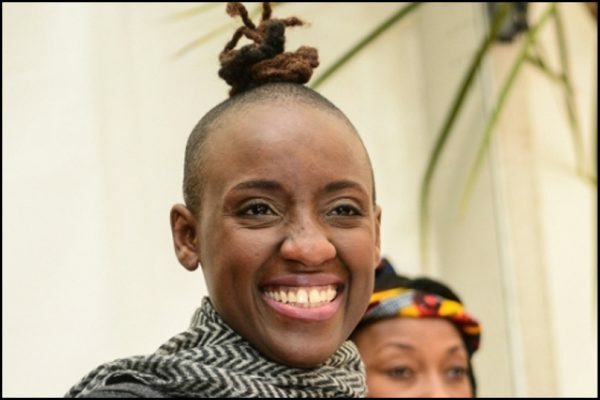 In 2001 the Senegalese group Daara J received the first Festival Award ever. By now several musicians like Miriam Makeba, Manu Dibango, Lokua Kanza and Angelique Kidjo, just to name a few, have been honoured with our award. 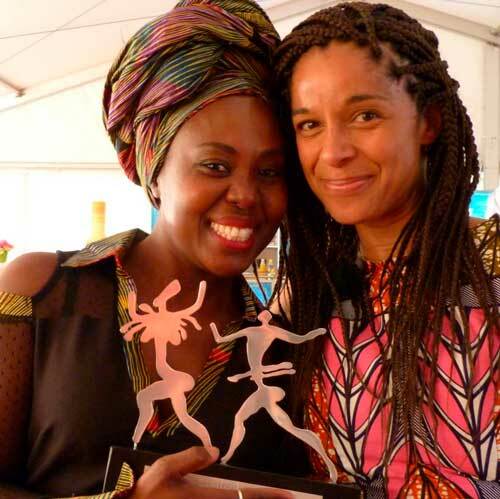 Moreover, institutions like the South African Anti – Aids- Initiative “Steps for the Future” and the Tuareg organisation Efes, who have hosted the extraordinary Festival au Desert in the desert of Mali, have received this award. I am pleased to introduce you to our two newest honourees to mark the 20 years anniversary of the Africa Festival. The first one to be named has been working with us for the first time this year. His pictures made and shaped African history. Over 50 years ago a young photographer travelled to South Africa, which was at this point completely unknown to him. There he was able to keep records of the development of apartheid in the 50ies with his striking pictures and there fore, as it was recently precisely said, he gave apartheid faces and names. Furthermore, he has captured some very expressive photos showing the music and musicians of South Africa, which is currently part of our Kulturspeicher exhibition. Through the quality of his pictures he has become an important mediator between the black and the white population of South Africa. The second Festival Award is a sign of thankfulness as well. 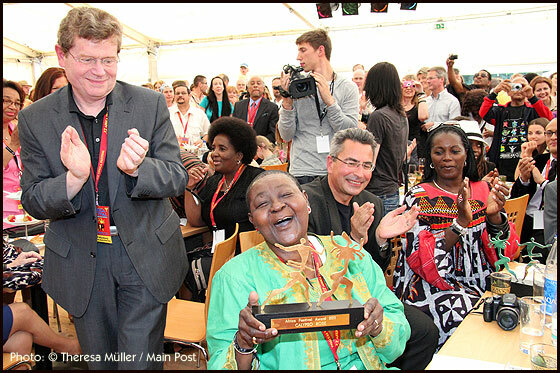 The fact, that the Africa Festival is taking place in Würzburg is, as we all know it, a fortunate coincidence. We just happen to be at home here. Maybe the one or the other scrutinized us a bit sceptical at the early beginnings of the festival. 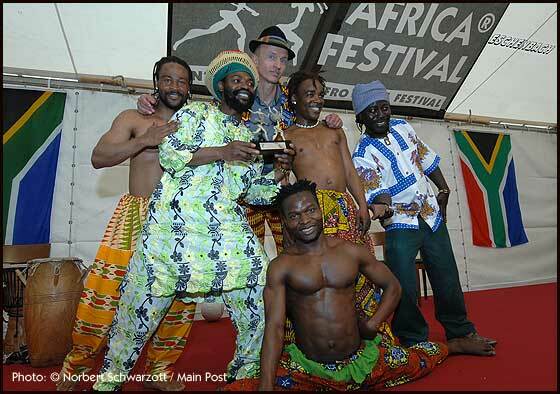 When we started, 20 years ago, to provide the music and culture of Africa a base in Würzburg it appeared rather exotic. Luckily, though, the persons in charge at the municipality were willing to support our intentions. At the beginning these were the, at the time, cultural affairs officer Dr. Voll and director of the office for cultural affairs Gabriel Engert. Also, all the following officers and lord mayors, not to mention the city council never left us out in the rain. That the city of Würzburg even supported us when they were in a tight financial spot, is something we really have to give them credit for. We really appreciate your support. Please remain loyal with us for the future! 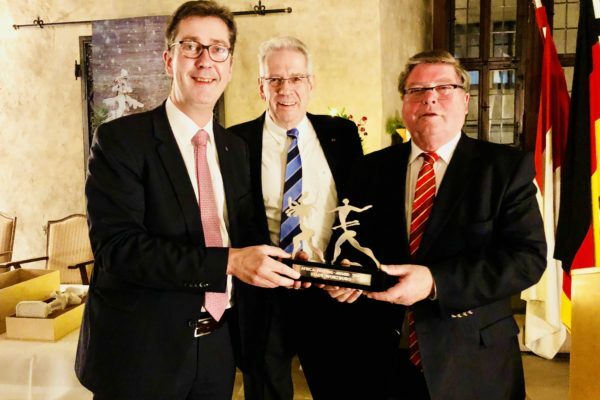 As a token of our gratitude for our 20 years on – going cooperation, I would like to present the Festival Award 2008 to the Lord Mayor of Würzburg Georg Rosenthal. Every year, the Africa festival gives away the Africa Festival Award (AFA) to musicians and artists who stand out because of their special talent. Furthermore, the award is given to institutions or people who have committed their work to Africa in a special way. The award is given away during the official opening of the festival. 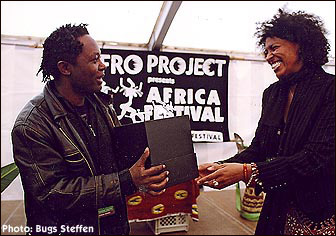 At the Africa Festival in 2007 the Festival Award was given to German-Nigerian singer and musician Ade Bantu. With the award we honoured his great commitment to fight against daily racism in Germany. With his project „brothers Keepers“ Bantu and his musical colleagues demand to put an end to discrimination. 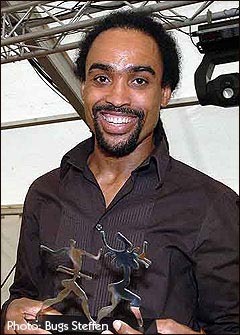 The award also honoured the movie “Yes I am “ in which Ade Bantu plays one of the lead roles. In the movie three afro-German musicians talk about their daily lives and experiences in Germany. Recently, Ade Bantu made headlines with a resolution which demands and end to sexism and racism in German hip-hop. In 2006 a singer who has already enthused thousands of visitors at the Africa Festival received the first Africa Festival Award. She embodies what the aim of the festival has been from the beginning and still is: giving young singers a base for a great subsequent career. In 1992 Angelique Kidjo performed for the first time in Würzburg at the 4th edition of the Africa Festival when she was still a young unknown singer. Today she is known around the globe. She is a true ambassador of Africa and pleases people worldwide with her unrivalled voice and outstanding stage presence. A man who always enchants his listeners with his wonderful voice has been connected to the Africa Festival for many years, too. He is always a welcome guest. He also first performed at the Mainwiesen when he was still an inside tip. He was able to conquer the hearts of his listeners with his singing for the first time in 1994 at the 6th edition of the festival. His songs and voice cannot be imitated and he is always looking for new ways to bring his songs closer to the audience. 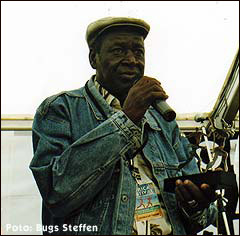 Therefore Lokua Kanza from the republic of Kongo received the Festival Award in 2006. 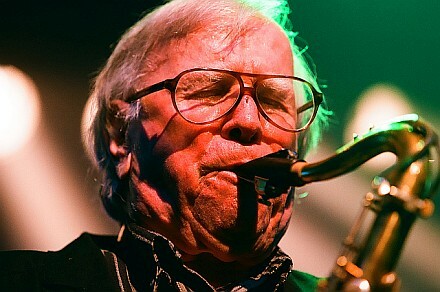 His deep voice and typicial saxophone will be forever entrenched in your ears. 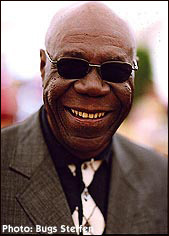 Anyone who has ever listened to Manu Dibango won’t forget him. He is one of the pioneers of afro jazz. In 1994 he released Wakafrika, which is one of the most important albums of African music of the last years. His trademark is “Soul Makossa”. 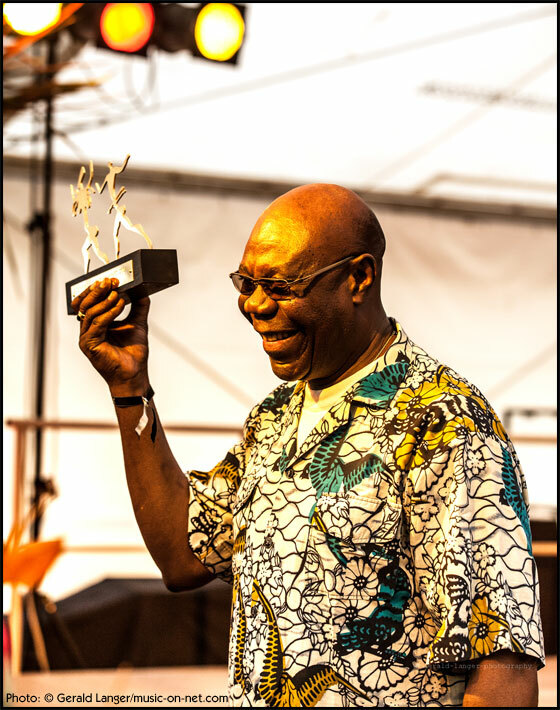 Manu Dibango is one of the pioneers who has brought the music of Africa to the whole world. He received the award for his musical lifework. The Africa Festival is living off of music, however, it requires many people backstage so that the music can be played at all. When there were ambassadors from 33 African countries in 2006, when musicians performed, who didn’t have a visa until shortly before the festival, then one man was responsible who has been tightly connected to the festival for many years. He has been an ambassador for several African countries, a representative for Africa of the Federal Government and, since he has retired, his full-time job is being our chief of protocol. More than once Harald Ganns has been a knight in shining armour and for his commitment we thanked him with an Africa Festival Award. In 2005 there were again 3 awards. The first award was given to the exceptional musician Boubacar Traore. His voice was already heard on the radio in Mali in the 1960s at the times of the independency. Until today he has stayed loyal to his music and receives the Africa Festival Award for his musical lifework. The second award went to Thabiso Motsusi und Moalosi Thabane from South Africa. The two young men have been committed to raising AIDS awareness in their country despite them being afflicted by the disease. With the anti-AIDS movies of “Steps for the future” they mainly travelled to rural areas where they motivated the population to take steps to prevent AIDS. 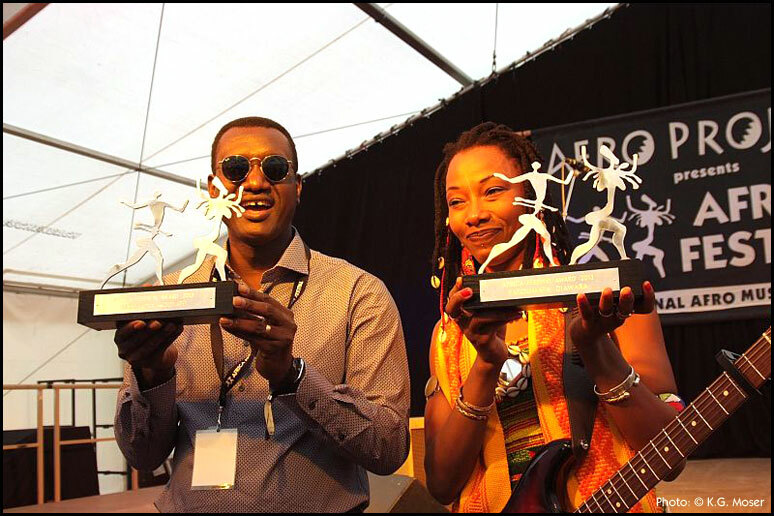 The third award was given to the members of the non-profit organisation Afro Project. 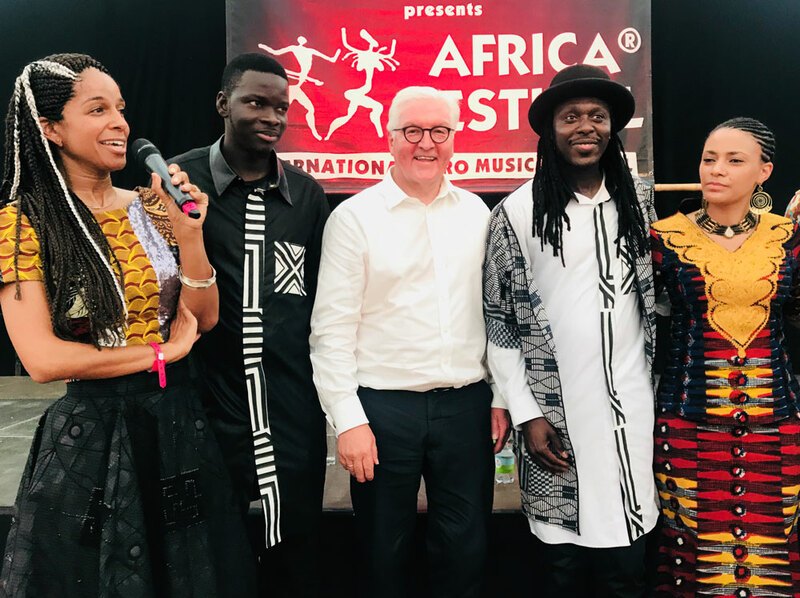 For 17 years the members have been committed to working for the Africa Festival, the biggest festival for African music and culture in Europe in their spare time. 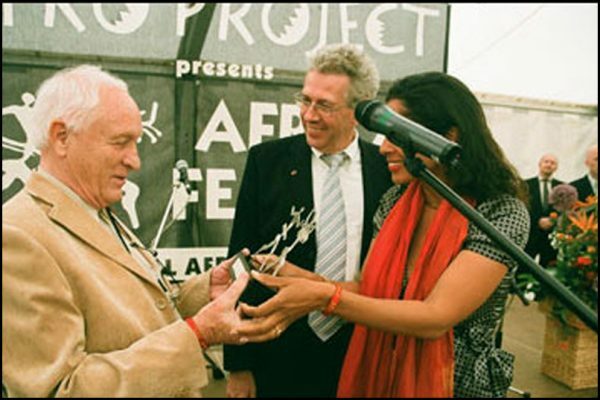 In 2004 the Africa Festival Award was given to the anti-Aids initiative "Steps for the Future" from Cape Town for their great commitment to prevent Aids in South Africa. They are trying to educate the population of Southern Africa, mainly in rural areas, about AIDS by using movies. 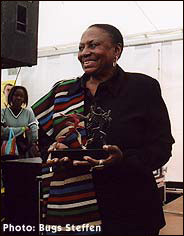 Another award was given to Miriam Makeba from South Africa. 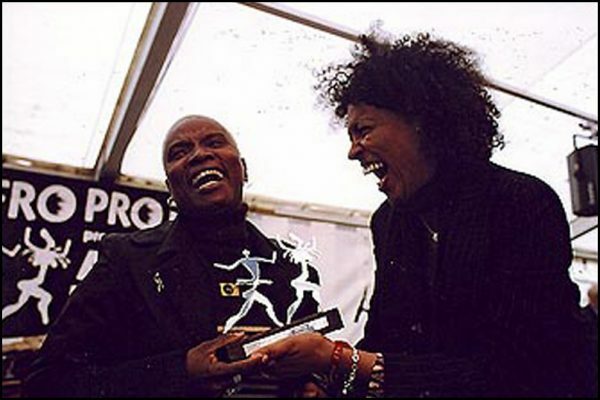 She didn’t only receive the award for her exceptional voice and great musical career, but also for her commitment against apartheid in South Africa. 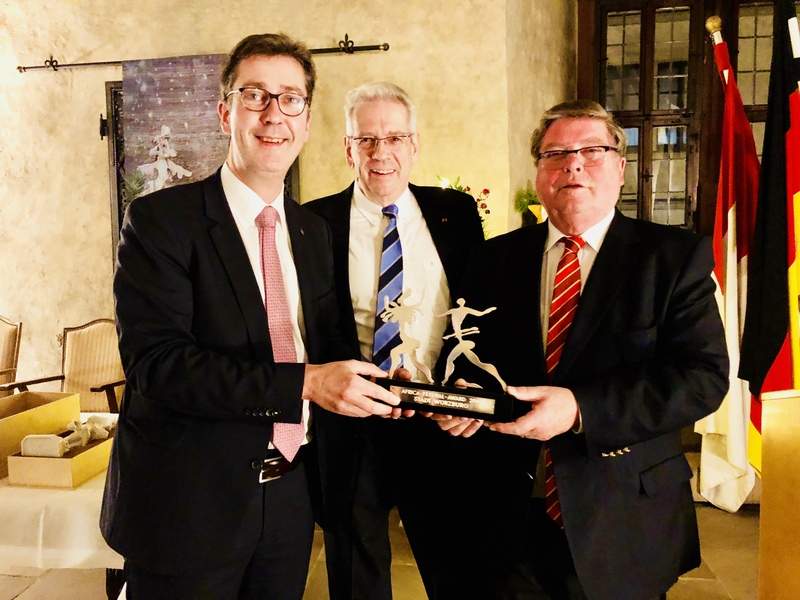 The third award was given to 7 employees of the Mali Nord Projekt by the Gesellschaft für technische Zusammenarbeit GTZ for their commitment to fight against hunger and for peace. The North of Mali was hit by two catastrophic draughts. As the promised relief supplies didn’t arrive, the Tuaregs started to revolt which lead to years of belligerent disputes and many people dying. The Mali Projekt has played an important part in restoring peace. 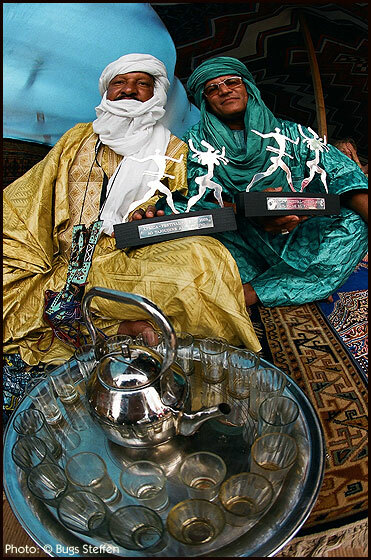 In 2003 photographer Jean Marc Durou received the Africa Festival Award for his brilliant pictures of the Sahara and der Tuaregs. 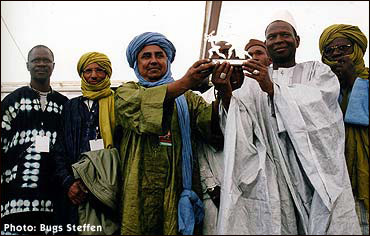 Another award was given to the employees of the Tuareg organisation Efes from Mali for organising the "Festival in the desert". The festival takes place in the middle of the desert under demanding organisational and logistic conditions. In 2002 the Africa Festival Award was given to singer Seydu from Sierra Leone for his album "Diamond Tears". He dedicated the album to the children of his home who were victims of the diamond war between 1992 and 1995. 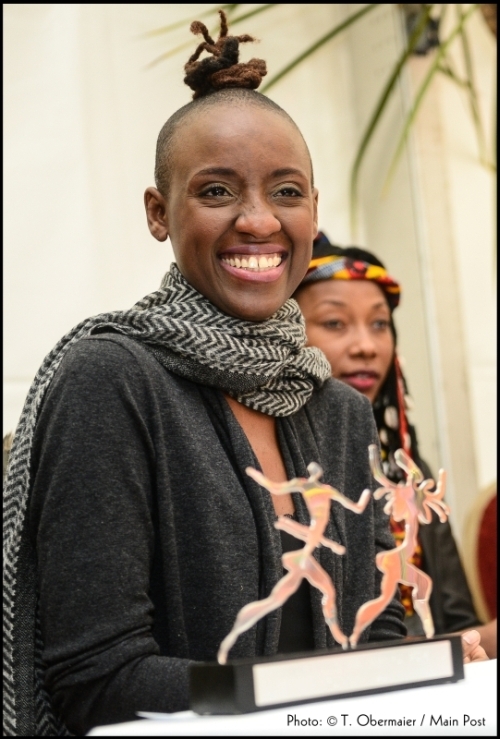 The second award went to the Senegalese fashion designer Oumou Sy for her extraordinary creations and her commitment to fashion in Africa. 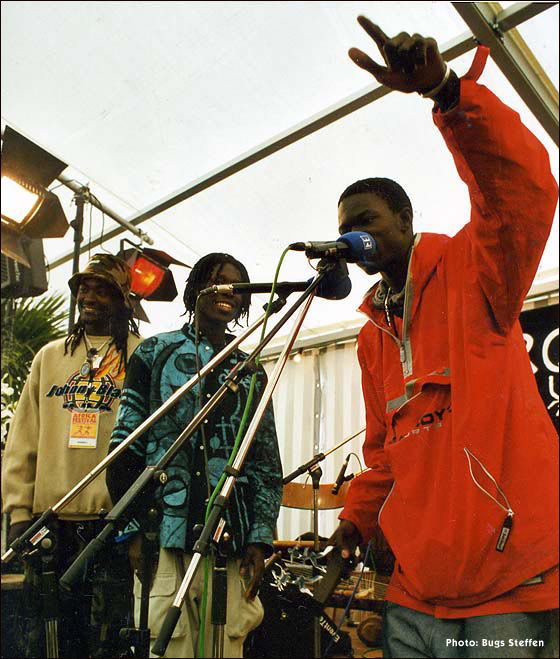 In 2001 the first award was given to Senegalese music group Daara-J. Rapper Lord Alaji Man, Faada Freddy and N’Dongo D impress their audience with their musical talent and dynamic performances.